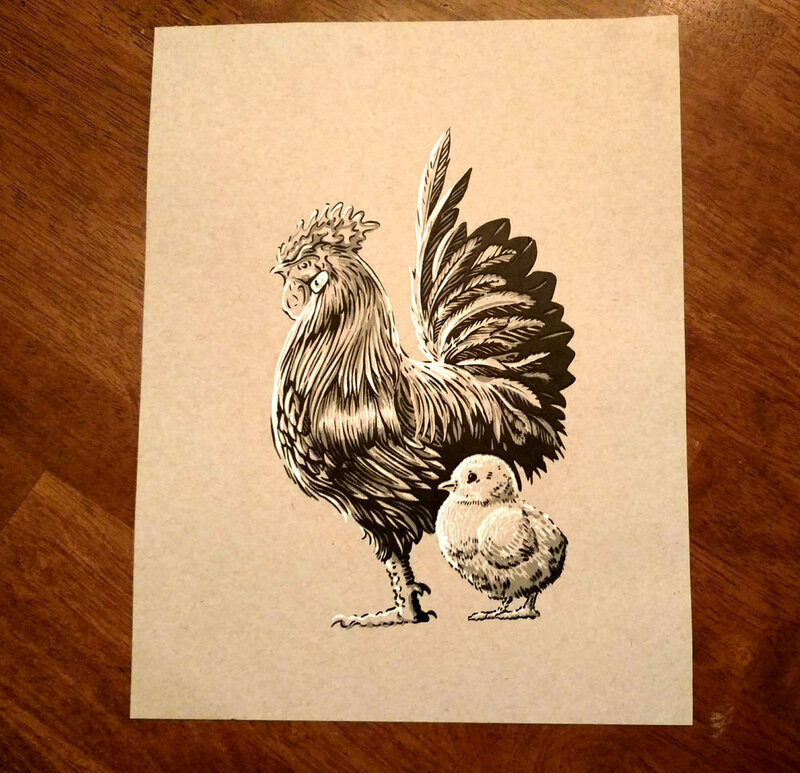 I printed my Rooster and Chick artwork on paper this artsy frenchpaper.com Kraft-Tone warm grey paper and then, just as an experiment, got these canvases from Job Lots, brushed them with acrylic, spattered them a little, sprayed the edges black and printed my chicken on it. The goal is to create canvas artworks that don’t have to be framed. It’s perfectly fine to leave the edges of a canvas showing. Not futzing with a frame saves a lot of time and effort. is the brushed/sprayed canvas going down a Elvis-on-black-velvet hole that I don’t want to go down? It’s more striking to look at, but the paper print is probably classier. I asked on Facebook and got a lively discussion out of it. It’s an even split, like classy vs cool. Instead of a devil and an angel arguing I’ve got a swishy interior designer and a street level graffiti kid. My wise-beyond-her-years 10 yr old and I trudged through 6 degree ear-aching wintery Concord cold to attend a League of New Hampshire Craftsmen opening last night. There was also a show from the New Hampshire Furniture Masters with many beautiful, beautiful things on display. Oddly, the unseen furniture artists are the craftsmen I most identified with, they seem to have a similar wildly impractical love of the work that I feel. Somewhere behind their perfect, precise art is a mechanical mind contemplating tools & chemicals, trips to the hardware store and constant troubleshooting… but at some point those furniture makers decided not to use that mind on fixing cars or building solar panel arrays or something, but in creating beautiful things. I like that. Looking at that amazing craftwork it became sort of crystal clear that my spray-painted chickens aren’t going to fly. Precise matting and framing is a big deal to those guys, and no mistake. “Hello, do you like furniture?” asked some sweater-wearing middle aged schmuck attempting to engage in uselessly trite small talk and I did not yell “LEAVE ME ALONE I’M HAVING A CHICKEN EPIPHANY” but instead smiled and said “Sure, it’s beautiful” and awkwardly dove in. Are Bank Lobbies better places to show art then cafes..?